Hi everyone I'm Jack Red, I remember in two schools playing Jazz Jackrabbit 1 & 2. For some reason it had a huge impact on me. More recently I finally bought both Jazz Jackrabbit games on GOG. At one point people called Jazz PC's Sonic since he has somethings in common with him. Jazz Jackrabbit series eventually died off thanks to Jazz Jackrabbit on Game Boy Advance. GOG made sure you truly get the complete experience with the first two games. Hard to believe the same company later started Gears of War series. You get all the extra levels added in later versions. They also included some nice bonuses. You get JJ2+ mod that acts more like an updated version that's still being updated today. Jazz Jackrabbit was a game I always looked forward to playing. Even right now I still want to play it after beating all the episodes. I know I shouldn't say this but chances are if you haven't played a classic DOS shooter platformer. I might as well talk about how it plays. Similar to many DOS classics including the first two Duke Nukem games. You have several episodes with six being the entire original campaign. On CD version they added Episodes A-C that technically took place before Episode 6. It is sorta like Wolfenstein 3D Episodes 4-6 & Spear of Destiny before that. They pulled the classic Star Wars route where we get later parts of the story first. Jazz Jackrabbit is much faster pace than most DOS games of it's type. You do get great power ups & upgrades to make some tough levels easier. I still wouldn't rely on it too much especially in later episodes. I usually don't talk much about a game's soundtrack. WOW it was amazing back then & still pretty awesome too to hear these songs including those I haven't heard before. You get a great variety of enemies with some throwing in a monkey wrench in your places. Some enemies are barely big enough for you to jump over them. Some are very likely to hit you before you hit them. Some bosses like Episode 6's Evil Jazz can be frustrating. I do like each boss fight represents a particular episode very well. Most levels are very replayable with a few exceptions. Like Episode 2's Orbitus Level 2 has a glitch not present in earlier versions. There is a strict path with difficult to make jumps. Unfortunately the area for the second jump if you do somehow get there doesn't work how it is suppose to. I had to use a code for the board to get through it. I spent a lot of time with this level being the only one in this game I had to cheat to finish. I am not the only one complaining about this issue either. Like many DOS classics, Episode 1 is the only one available for free. It is also the shortest among the original campaign. Now back to stuff added to CD version. Some of these levels within Episodes A-C are tougher than those found in Episodes 1-6. Some of my favorite levels are included in those episodes. They also add more game play variety to the experience. Like in some levels you have to swim a lot while others you are using the board to search for a way in huge space ships. This is where things start getting confusing. Holiday Hare 94 was released to quickly get added to CD version. This adds three very different levels that are Christmas theme. For one quick moment, I don't have many Christmas theme games. Most that would count are Christmas theme expansions like Duke: Nuclear Winter and all of them for Jazz Jackrabbit series. Usually a planet has two levels you have to complete. However some worlds do have secret levels with an alternate ending sign. Regularly you look for signs of Devan to complete levels. For secret levels you are looking for ? signs. In that regard differs from many DOS classics like Wolfenstein, Doom & Duke 3D. They later added Holiday Hare 95 the last of the extra levels for Jazz Jackrabbit. Not many differences after starting it up until you get to the Episode selection screen. A different name for Episode X because this is where Holiday Hare 95 replaces Holiday Hare 94. I heard if you play these on Christmas or change the clock in your computers you can play these levels. Thankfully GOG made it to where you can play both expansions at any given time. They also made it to where you pick which Holiday Hare you ended having at that time. The first option is essentially what you would find on CD version. The second option replaces Holiday Hare 94 with Holiday Hare 95 I hope this helps with the confusion many people have. I should talk about the bonus levels. The entire point of these is mostly testing how well you can use your keyboard. You actually end up using more of your hands than playing the actual levels. If you do successfully complete one of these you will get an extra life. Now the game does give you the option to go straight into those bonus levels. Jazz Jackrabbit was mostly inspired by Sega's Sonic & Capcom's Mega Man. I haven't seen many characters similar to Jazz Jackrabbit. Although I will name a few Bucky O'Hara & Hoppy aka T-Hoppy from ClayFighter series. This game requires memorizing, patience & sometimes taking risks. I highly advised you could die a lot in this game. Jazz Jackrabbit 2 up til GBA game was the last Jazz Jackrabbit game for several years. I couldn't play the original with my controller. WOW playing Jazz Jackrabbit 2 with my controller was a very great experience. This game build on what I loved about the original but made it even better in every possible way. Originally you get two playable characters Jazz and his brother Spaz. After the release of Jazz Jackrabbit 2: The Secret Files they added a new character named Lori. A true fact some members of the team didn't agree among themselves how Lori would fix in. Some wanted her to be Spaz's girlfriend while others eventually made her their sister instead. You know what if you can't decide out of those two why not simply call her their sister-in-law. She was be a sister in a sense to Jazz but also dating Spaz at the same time. Anyway moving on a great variety of enemies that will keep challenging your skills. Spoiler alert there isn't as many episodes as the original Jazz Jackrabbit game. I felt all of them in Jazz Jackrabbit 2 ended up being better. Each character is better at something the other characters aren't great at. Which means there technically isn't a best character although I disagree. Spaz ends up being the best character due to his double jumping. Lori is the worst at jumping in general. The soundtrack is once again amazing for it's time that still holds up incredibly well today. You get five episodes originally. A lot of people enjoyed the demo levels enough to later included them in The Secret Files. Each cover picture in this game is parodying several classics like Doom, Back to the Future, The Artist Formerly Known as Prince and a few more pop culture references. I am not saying I didn't like the cover pictures in the previous game. I do like them a lot but when you do pictures like these you really can't compete with them. You also get a sixth episode that helps gives you a more complete experience. They later added Holiday Hare 98 that ends up being it's own game. Probably because many people are still confused about how they did Holiday Hare 94 & 95. I would say one of the toughest bosses in the entire series is present in that Christmas episode. Oh wait there's more to talk about. Believe it or not, Jazz Jackrabbit 2 has multiplayer. You can play these levels & more with other people. Now isn't that awesome oh wait it gets even better. Although you have to search stuff your Jazz Jackrabbit 2 files for this feature. Yes you can create your own levels or play other user levels. Before getting any of them both the actual game & Holiday Hare 98 has some custom levels already loaded in. I recommend if you want to make your own levels or episodes. Make sure you look up great guides for them otherwise you will be very overwhelmed by the process. I would say the bosses are better overall. You get very designed levels that could take a long time to fully explore. I also like because we are looking further away from them that you can see more of the levels. 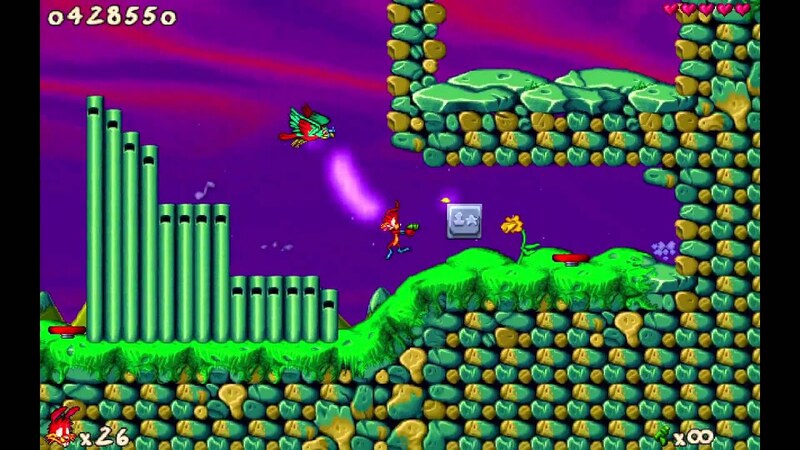 In the original Jazz Jackrabbit, some areas are difficult to tell if you might get hit by enemies or hazards after doing a long jump. Finally the mod I was talking about earlier JJ2+. This fixes many glitches included in the game. They also added more modes of play in multiplayer. This also improves the level creator feature. For those wondering how did this mod get included in GOG's deal is a rather interesting story. Regularly some expansions for games they have for purchase is actually mods made by other people or teams. Those are licensed & given permission from the team behind those said games to be released. What makes this mod interesting is it was free ever since it started. They knew many users over the years are taking care of the game since the original team won't anymore. Yes I know some of them are famous among gamers including the same guy involved with Gears of War series. Obviously the gaming industry moves even the smallest member to other things eventually. JJ2+ mod has a big popularly among DOS gamers that's still going strong today. It probably went up a lot since these games got on GOG. Basically it may not have as many episodes as the previous game. At the same time what it actually has makes it a truly unique experience. 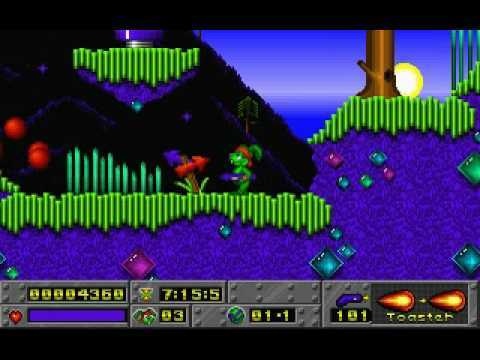 Jazz Jackrabbit 2 is possibly one of the greatest DOS exclusive games I ever played. Now it's time to rank both Jazz Jackrabbit games. The worst in this particular case is still very good by my standards. There is no losers in today's blog folks. Both of them sure pack a lot of content that will take many hours to go through.